thanks to Jennifer’s review, I think I may have to try Unsheltered. Happy Saturday! Today I have a review of Unsheltered by Barbara Kingsolver and publishing on Tuesday via Harper Books! I’ve only read one other Kingsolver book, The Poisonwood Bible, which I deeply enjoyed. If you visited my blog yesterday, you saw my First Line Fridays post featuring this book. I ended up finishing it tonight and figured I would go ahead and post my review because next week looks pretty busy! Please read on for my thoughts on Kingsolver’s newest effort! Mrs. Hudson, Sherlock Holmes’ landlady, asks for his help when a friend is suspected of killing her lodger and he and Dr. Watson are happy to jump in, having no idea what they’re about to get into. When the legendary Allan Quatermain, the Victorian version of our Indiana Jones, comes on the scene, everything becomes a great adventure. The murdered man had, by his own telling, recently been in a civil servant position in Calcutta but Sherlock quickly determines that to be a lie and that he was, in fact, in Africa. Moreover, Sherlock questions the man’s very identity and, even more intriguing and disturbing, a stranger follows Holmes, Dr. Watson and Mrs. Hudson when they leave her friend’s house. That individual is soon revealed to be the aged Allan Quatermain, famous big game hunter in Africa, and he delivers a warning that delving into the mystery of the murdered man is very dangerous and should be dropped. Naturally, that warning falls on deaf ears and Holmes and Watson are soon deeply involved in the case beginning with a fruitless trailing of Quatermain. Deducing that a journalist is somehow involved, the pair are off in pursuit of the truth behind the lodger’s murder. The setting of this story really evoked the Sherlock Holmes era and environs plus it offered a strong sense of the reach and effect of the British Empire. James Lovegrove is an author with a special interest in Sherlock Holmes and he has developed a very credible pastiche with a variety of novels. 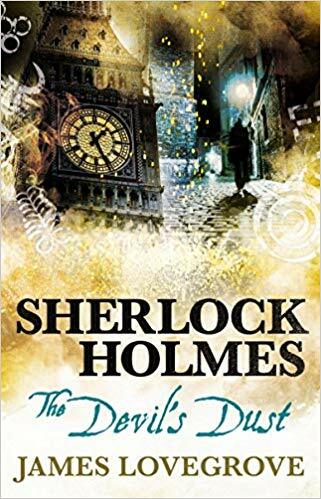 He has a fine touch, an understanding of Holmes and of Sir Arthur Conan Doyle’s style and creative bent; I’m going to check out his other Sherlock Holmes offerings.